The author has spent thousands of dollars obtaining rare documents relevant to this history (such as a 1641 edition of Foxe’s unabridged Acts and Monuments) and researched the topic in important theological libraries in Canada, America, and England, including the British Library. The book covers the Roman Catholic Inquisition from the 11th to the 19th centuries, particularly the role played by the Inquisition to keep translations of the Bible out of the hands of the common people. It contains the history of ancient separated Christians, including the Waldensians and the Lollards. It gives the history of the English Bible from John Wycliffe to William Tyndale, and the history of the Spanish, German, French, and Italian Bibles. It contains amazing biographies of royal queens who loved the Bible. It gives the decade-by-decade details of papal condemnations of 19th-century Bible societies and of Roman Catholic persecution in the 19th century. 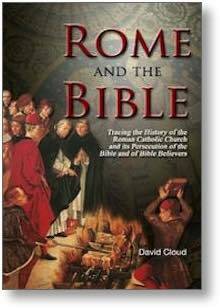 It describes the 20th-century phenomenon of Rome changing tactics and joining hands with the Bible societies. It documents the similarities between the Latin Vulgate and the modern versions. It answers the question: Has the Roman Catholic Church changed? The book contains 95 illustrations from rare out-of-print books. Dr. Ian Paisley, Martyrs Memorial Presbyterian Church, Belfast, Northern Ireland, commended us for Rome and the Bible and showed us his copy in which he had written the following words: “Brother Cloud is not beclouded!” Fourth edition revised and enlarged, September 2001.